The Baltimore Convention Center is the hub of entertainment, events, and life in the city. From concerts, dance recitals, fan fests for various groups, auto shows, and various conferences; the convention center attracts groups of people from all over the world and all walks of life.Below you will discover opportunities for lodging near Baltimore Convention Center and the many amenities the center has awaiting you. What the Convention Center Has to Offer First and foremost, the Baltimore Convention Center offers a variety of meeting spaces for events. It has small rooms for intimate gathering, mid-sized rooms for corporate meetings, or large open spaces for shows, conventions, and festivals. Guests will quickly discover, however, that space is not the only great part about the convention center in Baltimore. Business meetings are made easy with the use of the ABC Imaging Business Center, where guests can print a variety of material for meetings and ship items back to make traveling more convenient. Guests enjoy fine dining at their events at the convention center with a menu appropriate for business meetings, tradeshows, or even social gatherings. The in-house caterer, Centerplate, works to highlight Maryland flavors and provides small food outlets throughout the convention center for the convenience of guests. The menu includes pages of breakfast meals and a la carte options, as well as lunches, dinners, and light snacks. Unique meals include Maryland Jumbo Lump Crab Cake, Sesame Stir Fried Tofu, Mediterranean Seared Atlantic Salmon, and much more. The Baltimore Convention Center is also located near a variety of public transport options for the convenience of guests. There are many hotels near Baltimore Convention Center, but only three provide a level of style, service, sophistication, and comfort that will leave guests begging to come back. Each of the below hotels offers waterfront space for events, a convenient location in downtown Baltimore that is close to all of the Inner Harbor attractions. The Admiral Fell Inn provides unique and comfortable rooms that are decorated and designed with pieces to represent nautical history. Guests will enjoy the beautiful wood work, timeless charm, and modern amenities this boutique hotel has to offer. Rooms are each unique, ranging from cathedral ceiling suites with reading nooks and plush bedding, to rooms with hard wood floors and a balcony. The Inn at Henderson’s Wharf is rated as the #1 hotel in Baltimore on the leading travel site, TripAdvisor. This boutique hotel is nestled in among other charming buildings on a quiet cobblestone street in Fell’s Point. Guests enjoy the peace and quiet of a secluded hotel while still being within short walking distance from all the best shops, functions, and restaurants in the city. Each guest is equipped with a personal butler who is assigned to take care of every need that may arise during the stay. At Pier 5 Hotel, guests get all the entertainment they need right in the lobby with colorful lights, exciting sounds, and exciting activity. The rooms are almost as beautiful as the lobby areas and feature modern amenities. Rooms include large suites with sectional sofas that look out onto the harbor, polished king suites with sumptuous beds, and deluxe two-room parlors. This hotel features a Ruth’s Chris Steakhouse and a McCormick & Schmick’s Seafood Restaurant. 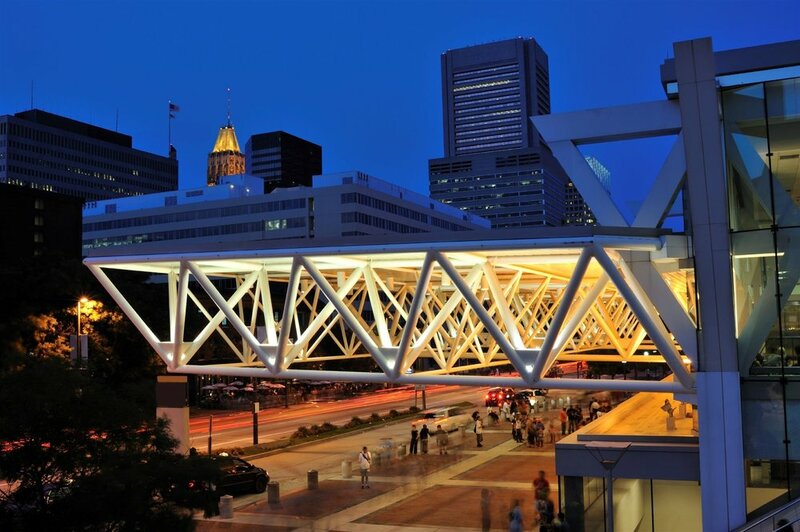 See for yourself, the incredible hotels near Baltimore Convention Center on your next visit!